The last time we saw the fan-cooled Trail RMK was model year 2010. The Trail RMK had an MSRP of $6,199. Both the new EVO RMK and Trail RMK have a fan-cooled powerplant. Here are some engine specs comparing the two. What jumps out to us are a couple of things. First, if you’re used to the smooth Cleanfire Injection on other liquid-cooled RMKs, you’ll definitely notice the difference when you fire up the carbureted EVO RMK. Second, you’ll notice that the EVO RMK is speed limited to 50 mph. As the new rider gets more comfortable and used to sledding, an Evolution Kit is available, which allows for higher speeds. In what some will think is an improvement over the Trail RMK, the EVO RMK comes with a CVTech PowerBloc50 drive clutch and Invance driven (also a CVTech product). The Trail RMK came with the P-85 drive and P2 driven. Part two of the Power To The Snow would be the track. The dimensions alone tell you the EVO RMK has a lug up on the Trail RMK. 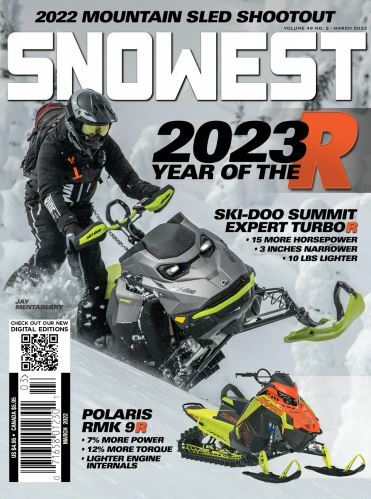 Whereas the Trail RMK sported a 15x136x1.25-inch track, the 2020 EVO RMK comes with the Backcountry 15x144x1.75-inch track. The EVO RMK should float better in the powder and provide better traction.